Another way to add margins is via Smart UV Project. Select all your object’s faces, hit U in the 3D View, then select Smart UV Project. A context menu will appear with an option for Island Margins. If you miss it, hit F6 to bring it back (if you’ve not made any other changes in the meantime). 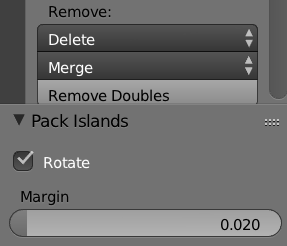 And yet another way to add margins is when you’re packing islands: in the UV Editor View, select all your faces and head over to UV – Pack Islands (or hit CTRL + P). In the 3D View, in the Tools Palette, there’s that margins option again. However, you can also press F6 in the UV Editor View and bring up the same window, letting you specify rotation and margins. It’s handy if you don’t have a 3D View showing.